Lyrics Of Appy Budday (Videshi) From Movie - Kismat Love Paisa Dilli (2012): A Playful song sung by Santokh Singh Featuring Vivek Oberoi and Mallika Sherawat. The Video of this song is available on Youtube at the official Channel Rajshri. The Video is of 3 minutes and 09 seconds. 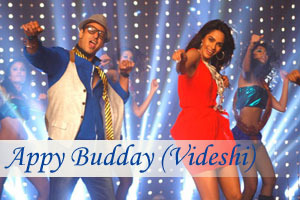 Lyrics of "Appy Budday (Videshi)"
Lyrics in Hindi (Unicode) of "एप्पी बड्डे (विदेशी)"